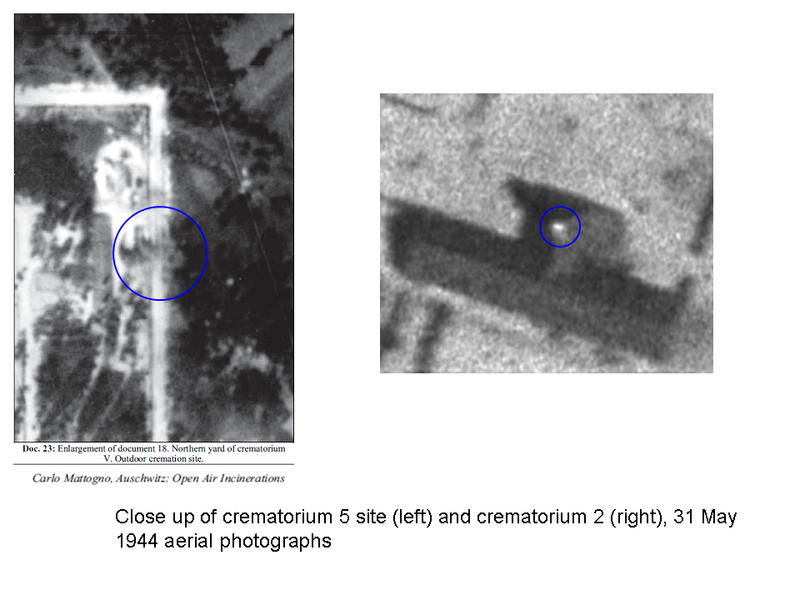 The Auschwitz open air cremation photographs (both the Sonderkommando ground photos as well as the aerial photographs) are examined if they provide evidence for mass extermination in Auschwitz-Birkenau - without resorting to testimonial evidence. The non-incriminating Revisionist interpretation of the photographs is discussed and checked against the available evidence. The two ground photographs taken secretly by the Jewish Sonderkommando in the second half of August 1944 (Auschwitz State Museum, neg. no. 280 and 281, for a discussion of their authenticity see The Auschwitz open air incineration ground photographs and Revisionist forgery allegations) are showing heavy smoke, naked corpses and prisoners dragging corpses towards the bonfire in the backyard of crematorium 5 in Auschwitz-Birkenau. The scene is strong evidence of open air mass cremation taking place. Smoke is covering the ground and the actual pyre is not visible, suggesting it it is actually located in a pit - a detail which is, by the way, corroborating numerous eyewitness accounts on the cremation of corpses in trenches in Auschwitz-Birkenau. The extent of smoke indicates a pyre length of several meters and a capacity of at least 25 corpses. Minimum stacking height (one layer) and pyre width (1.8 m) have been assumed. Of course, a higher stacking (e.g. six layers) and a wider pyre (e.g. 6 m) would greatly increase the capacity (e.g. 450 corpses), but this cannot be deduced from the photograph alone. In addition, there are at least some 20 corpses in front of the cremation site (Carlo Mattogno estimated the figure as 30 to 40 in Auschwitz - Open Air Incinerations [AOAI] p. 38, John Zimmerman counted about 50 cadavers). The extent of body disposal was thus at least at the order of many dozens of corpses. According to Mattogno, from "fragmentary documents [it] results that some 800 inmates died at Birkenau in May 1944, but the real figure was probably twice as high" (AOAI, p. 78), though he does not provide a reference for how he arrived to these estimations. The daily death toll was then 25 to 50 prisoners per day in summer 1944, if we believe and generalize this figure. The number of corpses per day would be somewhat higher when including Auschwitz main camp and Monowitz. At least the minimum estimation of activity visible on the Sonderkommando photographs appears compatible with the disposal of the daily corpses of the inmates of Auschwitz. But there is another thing to be considered here. Auschwitz-Birkenau was equipped with four crematoria with a cremation capacity of some 2400 - 4400 corpses per day and a morgue area of more than 2000 m² with a capacity of 2000 corpses (assuming 1 m² storage area per corpse). Thus, the crematoria were in principle - if in full operation - capable to dispose on a single day the deaths among the Birkenau "natural deaths" of a period of 1 to 4 months and could store corpses accumulated over more than a month. Already a single three muffle oven was able to cope with the daily deaths among the inmates. Now, these figures indicate that it would have been necessary for the camp administration to fall back on the out-of-favour open air cremations (previously carried out in autumn-winter 1942/1943) only if there was a breakdown of all crematoria for several weeks. A complete breakdown for several days only could have been easily compensated by the available morgues in the crematoria buildings. 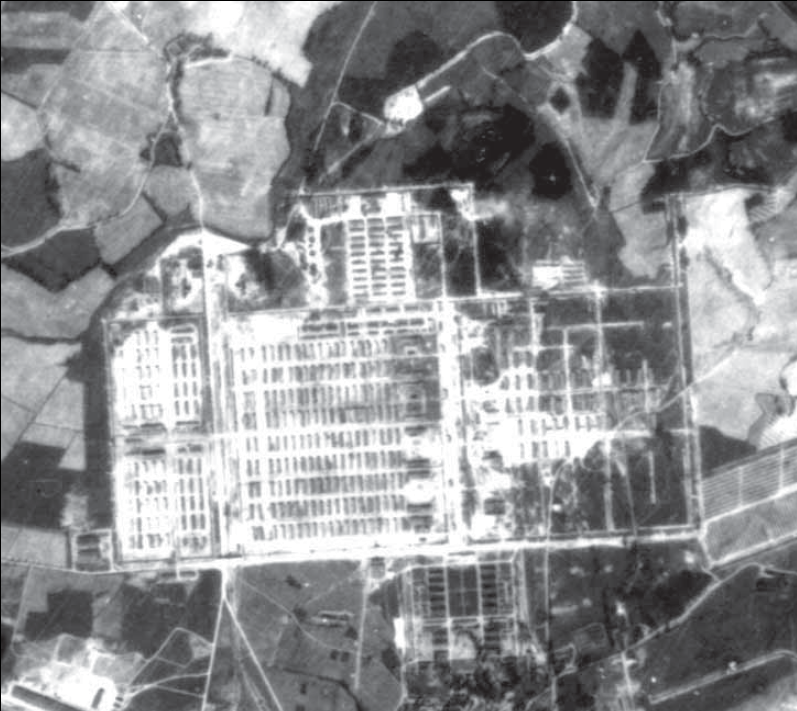 The aerial photographs indicate open air cremation in the backyard of crematorium 5 on 31 May, 8 July, 20 and 23 August 1944 (close ups from Mattogno, AOAI). Hence, the simultaneous breakdown of all crematoria in Auschwitz had virtually to extend over 4 months. This scenario is not impossible per se, but quite unlikely and then Revisionists would also face the dilemma that a simultaneous failure of the crematoria would largely fit into the picture of excessive use of the ovens rather then to their own hypothesis of only cremation of the "natural deaths" among the inmates. The available documentary evidence from the central construction office refers to some maintenance and repair work at the crematoria in the period in question (on the flues/chimneys and oven doors, see AOAI, p. 65), but does not indicate a simultaneous and prolonged breakdown of all facilities. The development of the crematoria personnel (318 prisoners on 15 May, 903 on 29 July and 874 on 29 August 1944) is further evidence against the hypothesis that the crematoria were largely idle in summer 44 with only incineration of registered prisoners taking place in the backyard of crematorium 5, but speaks for heavy activity at these sites (a discussion of the labour force reports on the crematoria staff and Revisionist arguments will deserve a separate blog posting see Auschwitz Labour Force Reports as Evidence of Sinister Activity at the Crematoria ). The issue whether some crematoria were active in the period can finally also be addressed by examining the aerial photographs of the buildings. It should be noted first that Mattogno's argument that "absence of any smoke rising from the chimneys of a crematorium is proof of its inactivity" (AOAI, p. 65) is highly questionable. 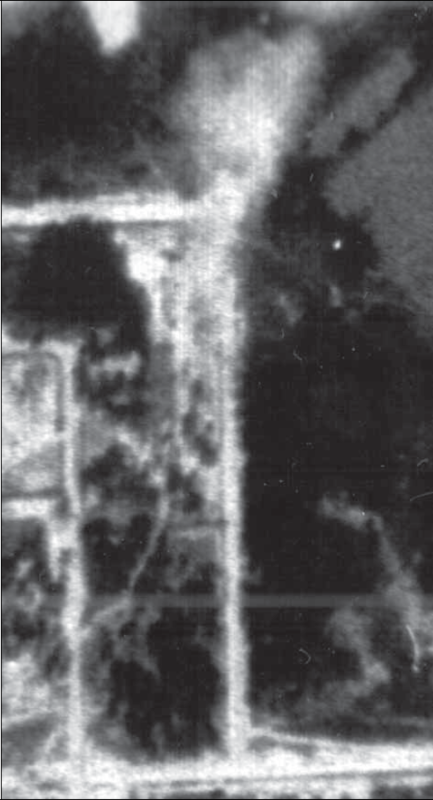 For one thing, Mattogno did not address whether any smoke from the chimnies observable from a person on the ground standing close to the crematorium would also necessarily be detectable on the aerial photographs taken from high altitude, some in rather poor quality actually. Secondly, even if a chimney of a crematorium did not smoke at the minute the photograph was taken, this says little about its activity earlier or later the day and if it was functional or not. The photograph is only a snapshot providing limited information on the time scale. One is grossly overestimating the information value of the photographs if interpreting absence of smoke as evidence of inactivity of the crematorium at the whole day (and night) or even as evidence for a breakdown, which is what Mattogno has implicitly done in his reasoning in AOAI. On the other hand, the presence of smoke from the chimneys is strong evidence for functioning crematoria and even under reduced load or with reduced number of ovens they should have been capable to dispose the "natural deaths" among the inmates. 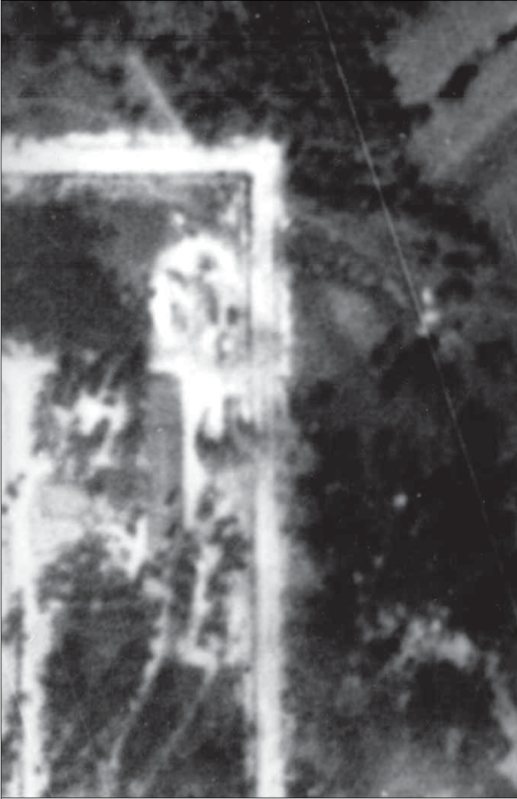 The chimney of crematorium 2 is kind of glowing on the aerial photograph of 31 May 1944. Note that the light spot is way too bright to be explained by reflection of the chimney bricks, which can be vaguely seen next to it. Therefore, at least one big crematorium was in operation on 31 May, yet the camp administration thought to burn corpses on a pyre in the open. Accordingly, the number of corpses piled up in Auschwitz had to exceed the "natural deaths" among the inmates by a large factor on these days in order to explain why open air cremation was carried out despite a functioning and operating crematorium. Such an excessive increase in the death toll can be reasonable explained by mass extermination. In a previous version of this blog posting, I also argued that the 20 August 1944 photograph would show a smoking crematorium 3 chimney. This conclusion was based on the analysis of Carlo Mattogno in AOAI, which I did not thought to rigorously check since the interpretation is actually not in favour of Mattogno's own hypothesis. In the mean time, a Revisionist who goes by the name "Bob" pointed out that the feature assigned as smoke is actually an artifact. It is noteworthy that Mattogno believed that crematorium 3 was active on the 20 August 1944 photograph, but he did not realize how the simultanous operation of crematorium 3 and the open air pyre at crematorium 5 entirely undermines his hypothesis the latter was implemented for "insignificant and sporadic cremation of registered detainees" (AOAI, p. 68). Instead, he argued that "the outdoor fire could...not have any criminal character", because Auschwitz historian Danuta Czech did not note any transport for extermination on this day. The argument assumed that Czech's Kalendarium is complete with respect to transports from the ghetto Lodz to Auschwitz, which took place at the time on a large scale. The assumption is naive at best but Mattogno definitely should have known better. As a matter of fact, he was well aware that Czech's entries for transports from Lodz are based on a list of registered male prisoners. The emphasis is on "registered" and "male". Thus, any transport, which was entirely liquidated (a case Mattogno has take into account here for the sake of argument) or which was sent into the transit camp without registration or from which only women were registered or - most likely - a combination of liquidation, transit prisoners, registered female prisoners, was not recorded in the list and did not end up in the Kalendarium. 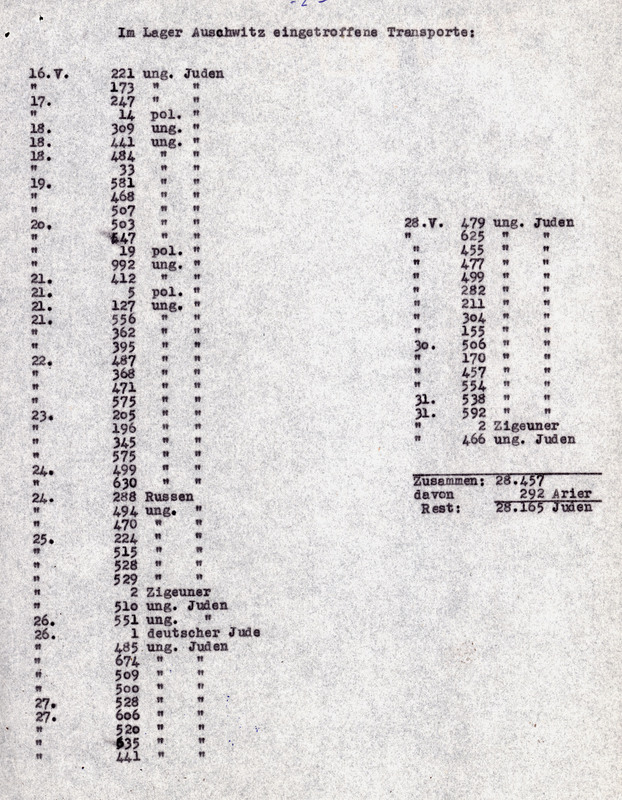 Actually, a more complete list of transports from Lodz to Auschwitz was found in the mean time (not available to Czech in her studies), which shows that indeed a transport from Lodz was arriving in Auschwitz on this 20 August 1944. 522 male Jews were taken out of the transport for labour and since they do not show up in the list of registered new arrivals they were apparently accommodated as depot prisoners without registration. 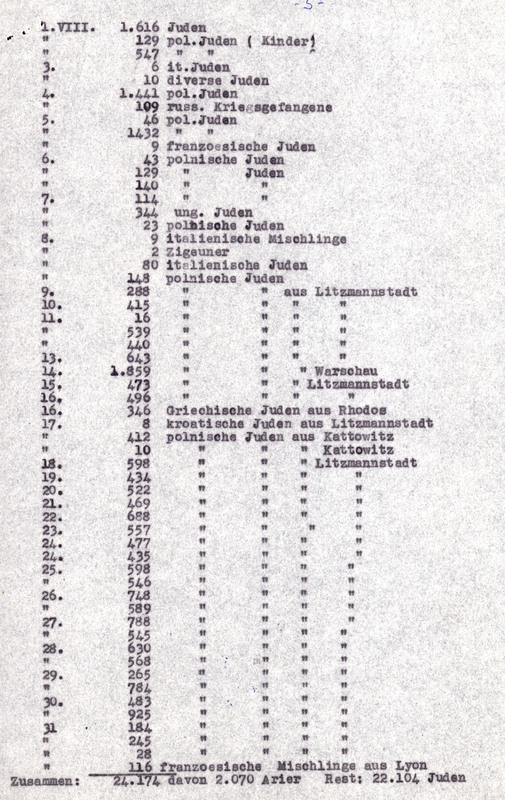 If the transport strength was 2500 as Mattogno assumed for the Lodz transports, then up to 1978 people (minus the unknown number of females taken out for labour) were exterminated on 20 August 1944 in Auschwitz. On May 31 1944, three Jewish transports from Hungary entered Birkenau with about 6000 people considered unfit for work. The figure was exceeding the cremation capacity of the crematoria and moreover the previous six days already 9000 Jewish people unfit for work were poured into Birkenau on average. The crematoria (however many were operating these days) were certainly not able to follow the pace of the extermination and open air incineration had to be employed, as indicated by the active cremation site behind crematorium 5 on the aerial photograph. 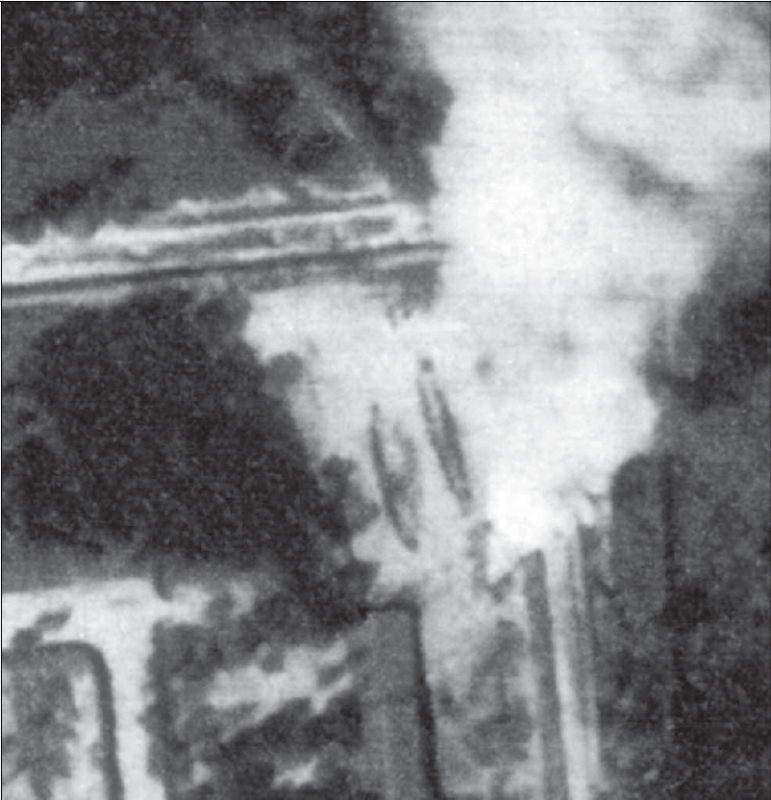 The high extermination rate on 31 May 1944 actually suggests that several pyres were necessary for the body disposal, but only one is recognized active on the aerial photographs of 31 May. As already pointed out, the photos only represent a moment and do not cover the whole period or day. The bottom line is that the open air cremations carried out in summer 1944 in Auschwitz are not reasonably explained by the need to dispose the "natural deaths" among the camp inmates. There is no evidence to support a simultaneous and long black-out of the crematoria necessary to justify the use of open fires in the camp. In contrary, aerial photographs indicate an occasion when at least one crematorium was functioning while open air cremations were carried out. This points to excessive accumulation of corpses in Auschwitz-Birkenau and supports that mass extermination was carried out. 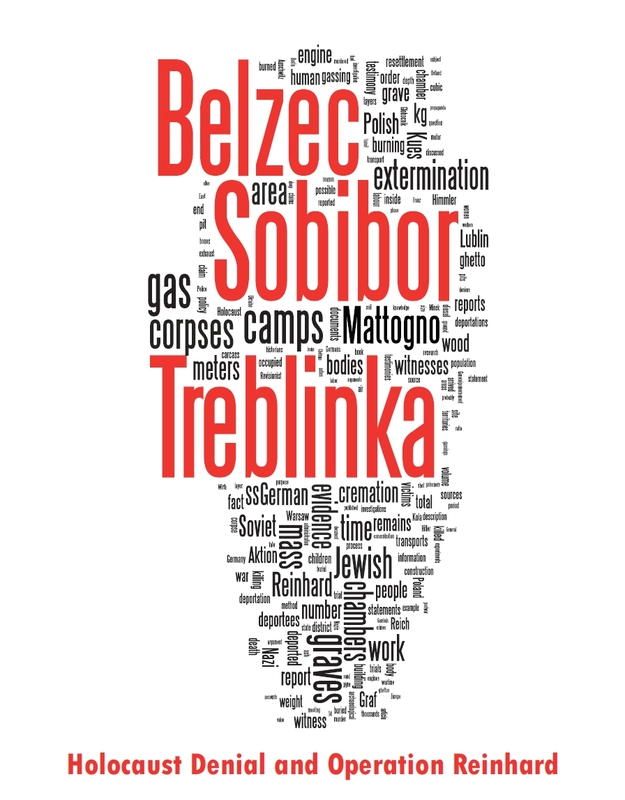 The use of open air cremation sites correlates with large scale deportations Jews providing a hint on the victims that triggered their operation. The interpretation is fully corroborated by testimonial evidence as well as by the contemporary secret message of the resistance of 4 September 1944 explaining the Sonderkommando ground photos - and vice versa. Thank you for this great post, thank you for defending the truth!! It's funny out the Holocaust deniers often yield great data (ie photos via free high res PDFs of their books), despite it often contradicting their own hypothesis. Thank you again for this great site. thanks for you nice comment and you are absolutely right, especially Carlo Mattogno's works are full of useful evidence for the Holocaust - testimonies, documents, photographs. One could make a solid case of, say mass extermination in Auschwitz just citing from his own books. 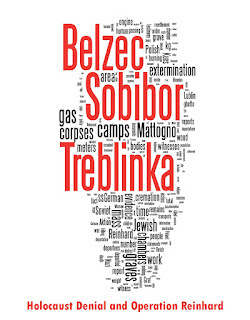 For anybody, who is engaging in debating Holocaust deniers and who cannot go to Eastern European archives himself to obtain and translate testimonies and documents, his free books are a real treasure - if you just get used to his lousy analysis in between the sources.